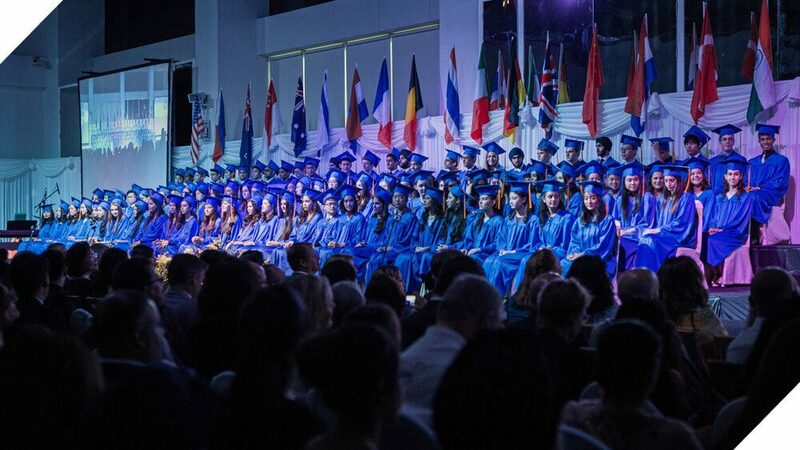 Each summer graduates around the world eagerly anticipate the announcement of the IB Diploma Programme exam scores, the final mark they receive before moving on to university studies. While NIST relies on the exam as a standard measure of its ability to prepare students for this next stage, it represents only one small piece of what makes a NIST education unique. Yet it was difficult to not be thrilled when the Class of 2017 built on a tradition of academic excellence by setting a new school record of 36.3, with 99% of the class earning the IB diploma. With the world average again hovering near 30, this places NIST among the best IB schools in the world with a large graduating cohort of over 100 students. Equally impressive were the two perfect scores of 45 earned by Saira Madarasmi and Sila Puhl, the school’s sixth and seventh in the last five years, and a mark reached by only 218 students this year. In total, 41.4% of the Class of 2017 received 38 or more points compared to 16.7% worldwide, and 16.2% received 42 or more points compared to 4.1% worldwide. Representing their diverse background, a full 48.6% of the class received a bilingual diploma, again well above the average one in four students who do so around the globe. Beyond the stellar exam scores, the Class of 2017 encapsulated the school’s values in their time at NIST. Its members worked with Chulalongkorn University faculty to create an early childhood centre for children in need, expanded a non-profit coffee company that provides a sustainable income for farmers in Omgoi, and tackled numerous other individual projects driven by their passion for making a difference in the lives of others. As they begin their studies at Columbia, Cornell, Johns Hopkins, Oxford, University College London and other universities around the world, NIST’s newest graduates will be well equipped to continue excelling and positively impacting their communities. Learn more about NIST International School’s record of academic excellence.